Since the news broke on Friday June 8th 2012 hat “Mega-church” pastor Creflo A. Dollar had been arrested for assaulting his 15-year-old daughter, the black blogosphere has been in an uproar. Responses range from rationalization that he was merely doing his job as a father, to the disbeliving and skeptical, to the blind faith that pastor Dollar can do no wrong. We cannot understand any justification for a 50 year old adult male who represents himself as a man of God tackling his daughter to the ground, slapping her, choking her, and beating her with his shoe. Many black people corporal punishment as a form of parental discipline; but when does meting out a just punishment cross boundaries and become terrorizing, physically abusing and degrading a child? Why is such violence towards females normalized in the black community? Why are black women so eager to justify physical assaults on children by grown men, and to protect and make excuses for anything vile or violent done by a pastor? These are the types of things discussed in detail in Deborrah Cooper's new book The Black Church - Where Women Pray and Men Prey. 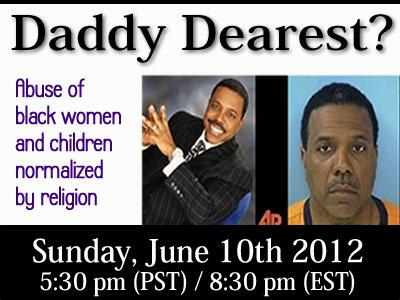 We'll discuss the book, Creflo Dollar, how black women have normalized abuse of females in the name of love and God. Call 347-327-9215 to participate in the discussion!